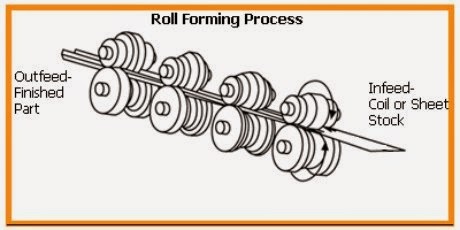 Roll forming is a continuous operation where sheets, strip, or coiled metal is bent or formed into shapes with an identical cross section throughout the length of the sheet. The process involves feeding the sheet between sucessive pairs of contoured tool steel rolls that shape it into the desired cross section. The sheet or coil may pass through one to ten set of rolls, or stands. This process adds both strength and rigidity to the metal sheet. The metal is only bent or formed during the roll forming operation. The thickness of the metal is not changed while passing through the rolls, except where tight radii occur, minimal thinning will occur. Care must be taken when designing the rolls to allow for a smooth transition from roll to roll, thus preventing blemishes on the finished surface of the sheet. The roll forming process has been in use for more than 1000 years. Roll forming, on a very small scale, was used in the formation of jewelry by Egyptians and Aztec indians. Profiles were cut into circular stones and gold or silver was rolled between them to create intircate shapes. The modern roll forming process was invented in the early 1900's for use in the construction industry. Doors, trim and moldings were soon produced quickly and efficiently. The industry has continued to expand , encompassing a global reach throughout many different types of industries. Roll forming can be a very affordable process when processing large quantities of sheet or coil. The initially high cost of the forming rolls is offset by the production of many thousands of feet of formed metal. Production speeds of 100 to 300 feet per minute are common. Roll forming is generally performed in quantities from 20,000 feet to many millions of feet. Coil handlers and stacking systems minimize labor costs, by reducing the amount of operator handling. Other metal forming operations, such as embossing and piercing, can be added to a roll forming line, making roll forming even more appealing to the end user. Most ductile metals including hot rolled and cold rolled steel, galvanized, plated and polished metal sheet, aluminum, copper, brass and stainless steel can be roll formed to tight radii. Sheets and coils as thin as .005” and as thick as 1/2” can be formed. The width and length of the finished part are only limited by the capacity of the rolling machine. Industires that commonly use roll formed parts include automotive, construction, home appliances, marine, medical, aerospace, agricultural and energy. Trim, door panels, roofing, framing studs, siding, and gutters are common roll formed products used in the construction industry. Rails, channels, angles, tubing, C, Z and T shapes are common shapes that are used throughout a wide spectrum of industries. Take a look around, there is a good chance that many of the products surrounding you will have components formed by the roll forming process. Double Decker Roll Forming Machines .